In this week’s news, Measles cases have also reached tech giant Google. According to the Centers for Disease Control and Prevention, 555 cases of measles have been confirmed in 20 states this year (as of April 11, 2019). As of this writing, the Ohio Department of Health has not confirmed any Ohio cases. However with the holiday season of Easter and Passover, Measles cases have the possibility of traveling into the state of Ohio, and starting a Measles epidemic here. Lets review the symptoms of Measles. The most common question that I have received from adults is this: Do I need a Measles booster shot as an adult. The answer to that is - It Depends. If you were born before 1957, you probably had the measles, so you probably do not need a booster. If you were born between 1958-1991, you possibly received one measles shot, which puts you at a 90 percent chance of being protected. You may want to talk with your doctor about possibly getting a second (or booster) shot, especially if there happens to be a local Measles outbreak in your community. Should I receive a Measles Booster Shot? Unfortunately, I believe that it is only a matter of time until the national Measles epidemic reaches Ohio. The best ways to prevent or limit the effect of Measles in Ohio are by two steps: Immunize and Recognize the signs and symptoms. And, of course, if you have any questions, contact your physician immediately. Two weeks ago, I knew that spring was on its way, because I was the one in the office who was starting to cough, and sneeze, and sniffle. Ahhhh, spring allergy season is here. I get a lot of questions from my patients about how to deal with spring pollen. And, is there anything else other than medications that people can take? Here are my five tips to help you during this spring allergy season. Beware of Spring Evenings: Spring pollen levels, like that of tree pollen and grass pollen have highest counts in the evening. Meanwhile, the ragweed pollen in the fall, is highest in the mornings. Take Allergy Meds: Some people take pills, some take nasal sprays, and some need allergy shots. Work with your physician to see what the best medication treatment is best for you. Unfortunately, it is in times of tragedy, when people start to ask questions about stroke. Yesterday, it was announced that actor Luke Perry passed away, at age 52, following a stroke (CNN). People are familiar with the term “heart attack.” Well, a stroke is sometimes called a “brain attack” in which a stroke is a blockage of blood vessels which cause a lack of blood flow to the affected area (ischemic stroke; see graphic above). Or, a stroke is a rupture of blood vessels in the brain, causing a leakage of blood (hemorrhagic stroke). According to the CDC, stroke is the fifth leading cause of death in the United States, and is a major cause of serious disability in adults. About 795,000 people suffer a stroke yearly. And, according to Stanford University, around 10 percent of people in the US who experience a stroke, are younger than age 45. I have also read reports that up to 1/3 of strokes occur at ages younger than 65 years old. I was reminded by someone on social media, that we have a local story of stroke in a young person, specifically a 16 year old girl who suffered a stroke at volleyball camp. Her original story was shared in the Fall of 2018, and her updated story is in the video above and at this link. So, the bottom line is this: A stroke is a tragic situation, and can happen to anyone at any age. The best things that you can do are to be aware of the signs and symptoms of a stroke. In addition, know your risk factors for stroke, control your chronic medical conditions (like high blood pressure, heart disease, and diabetes), stop smoking, and above all, check in with your health care team, and listen to your doctor. Check out more of my videos below, some almost 10 years ago - Yikes! Even though there is snow in the forecast, the beginning of March means Spring is right around the corner. Daylight Saving Time is Sunday, March 10, 2019, where we turn the clocks forward one hour, and, unfortunately, lose one hour of sleep. Increased Number of Heart Attacks: A 2012 research study at the University of Alabama showed a 10 percent increase in heart attacks on the Monday and Tuesday after the start of Daylight Saving Time. Increased Number of Strokes: A 2016 study from the University of Finland showed an 8 percent increase in stroke in the 2 days following the start of Daylight Saving Time. It’s hard to believe that February is right around the corner. As everyone knows, February 14th is Valentines Day, but did you know that Go Red For Women day is on February 1st, and this American Heart Association initiative is to raise awareness about heart disease in women. Heart Disease is the Number One cause of death for both men and women, and this is why I try to educate my patients on the risk factors for heart disease and signs/symptoms of a possible heart attack. Tobacco Use: These days, this not only includes cigarette use, but also vaping nicotine. In addition, exposure to secondhand smoke raises your risk for heart disease and heart attack. High Blood Pressure & Elevated Cholesterol: With regard to blood pressure, all levels above 120/80 raise your risk for heart disease. Both children and adults are more likely to develop high blood pressure if they’re overweight or have diabetes. With regard to cholesterol, talk with your Family Doctor about having your cholesterol tested and what the results mean. Routine blood tests can show whether your blood cholesterol levels are healthy. Unhealthy Diet: Foods that are high in saturated and Trans fats and cholesterol increase the “bad” cholesterol in your system. In addition, a high salt diet can raise your risk of high blood pressure. Added sugars can raise your chance of diabetes and obesity. Lack of Physical Activity & Obesity: Inactive people are nearly twice as likely to develop heart disease as those who are active. Especially with children and teens, it’s important to limit screen time and to encourage more physical activity. Cold Weather: Even though it’s not a major risk factor, especially those already with heart disease, if your’re involved in cold weather activities (like shoveling snow), it’s very important to listen to your body if you have any of the following signs or symptoms below. As I tell all of my patients, it is important to know your risk factors for heart disease and to work with your Family Doctor in taking steps like changing your lifestyle to improve your blood pressure, diabetes, and cholesterol. In addition, it’s very important to know signs and symptoms of heart attack and stroke. If you start to have any of those symptoms, it is very important to call 911 and/or to go the ER immediately. Keep Your New Years Resolution This Year! January 1st is right around the corner, and this is always a time to think of a New You in the New Year. 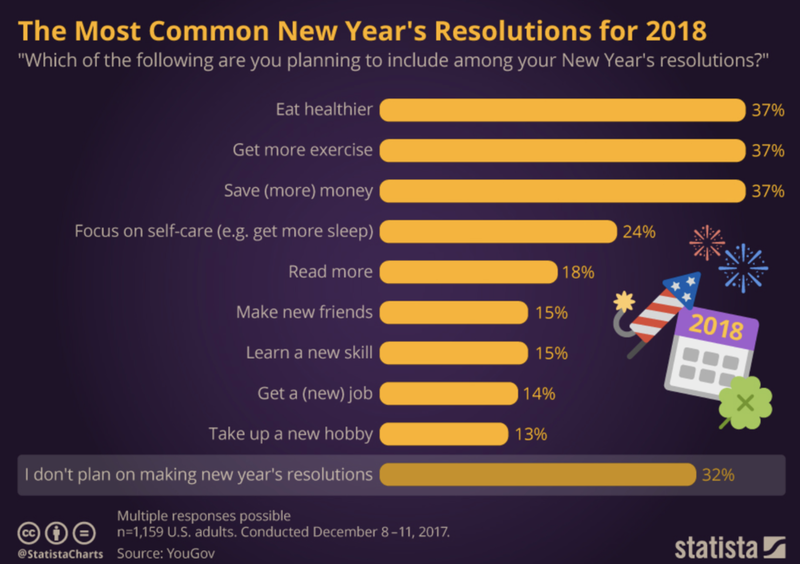 Every year, among our goals are better physical health and better financial health (see graphic below). Unfortunately, according to a recent study, only less than two weeks into the new year is when people start to fail on their resolutions. And, in this same study, only 8 percent of people achieve their New Year’s goals. Change One Behavior At A Time: It’s easy to visualize the ideal and perfect you. But, it’s also easy to overwhelm yourself with trying to change everything at once. Work toward changing one thing at a time. Talk About It: The more you share your goal with others, the more they will support you through this process. Don’t go at it alone. Your support system should keep you on track in a loving and caring way to help you achieve your goal. Track Your Progress: One of the ways you can keep yourself accountable is to write down your progress somewhere. Some people keep a notebook and write themselves notes. Other people use smartphone apps and send themselves electronic reminders. These will show you how far you have come, and what you can continue to improve. Don’t Beat Yourself Up; The road to your goal will be bumpy, and you will have setbacks every once in a while. If you have a bad day, this is not a sign to give up completely. Re-evaluate things, lean on your support system, and get back on track tomorrow. For my patients trying to achieve their health goals, I tell them that it took a long time for you to be smoking this much, or to get to this weight, or to be stressed out about things. It will take a long time to get back on track. With time, dedication, patience, commitment, and support from others, you will be able to achieve your New Years goals! Even though the holidays are a very busy, this is still a time of year to make your health and wellness a priority. I have Five Holiday Health Tips to keep a happy and healthy holiday season. Get Your Flu Shot: Yes, flu season will be upon us soon, and there is still time to get your flu shot. Also check with your doctor to see if you are also a candidate for other adult immunizations like pneumonia vaccine and shingles vaccine. Fight Holiday Stress: Even though the holidays are supposed to be a happy time, there will be those out there suffering from Depression during the holidays. I talk to my patients about this a lot. Check on those friends and family and co-workers and neighbors who may be struggling this time of year. Beware of the Excessive EggNog: Those holiday work parties are a great time to enjoy some alcohol and spirits. But, just like trying not to overeat, definitely do not over drink. And, of course, do not drink and drive. Look Toward 2019: It’s never too early to start thinking about goals and hopes and dreams for the coming year. Those New Years Resolutions are a good start, and I’ll have more to say about that coming up soon in a future article. Happy Holidays! Thanksgiving is right around the corner! One of the things I love about my job is asking my patients about their Thanksgiving plans and their holiday traditions. And, even though most of us associate Thanksgiving with family and friends, for many of us, Thanksgiving means food. Fruits and Vegetables: At least one third of your plate should consist of vegetables and fruits. This will help you control your hunger, while getting adequate nutrients. Save Your Calories: Save your calories for your main Thanksgiving meal. Reduce complex carbohydrates, consume moderate fat, and focus on lean protein. If you are going regular exercising, then try not to skip, but also do not increase your exercise, as this may make you more hungry. Don’t Beat Yourself Too Much: Because this will give you more stress. The joy of eating with your family and friends will be so much more, if you are conscious that the food you’re eating is becoming a part of you. Of course, when Halloween comes to mind, thoughts of candy and sweets come to mind. 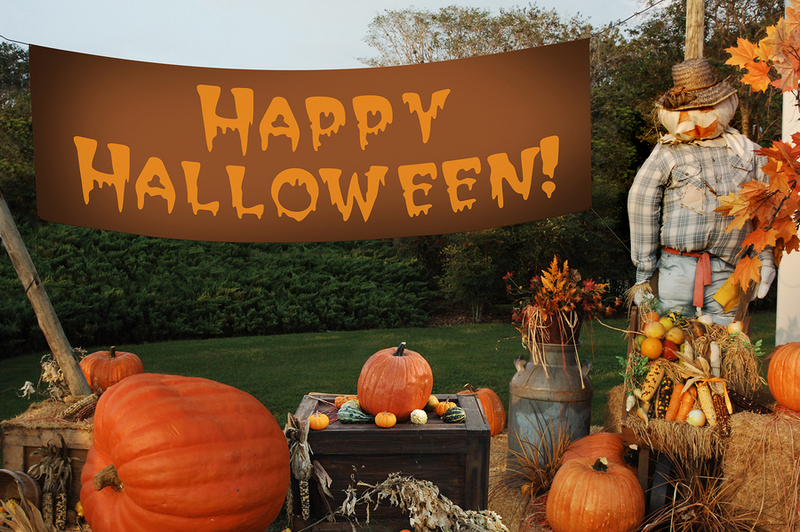 Did you know that the average child accumulates between 3,500 and 7,000 calories worth of treats on Halloween night? And, the dangers are not only sweet related. Did you know that there are more child pedestrian accidents on Halloween than any other day of the year? Last year, I shared with you some Halloween Safety Tips. This year, here are five Halloween Health Tips that I saw from this Time Magazine article. Fill Up Before Trick Or Treating: Having a meal and having the child feeling full before going trick-or-treating, hopefully will decrease their chance of munching on their treats before getting home. Hand out Non-Sugary Foods and Toys: instead of the traditional candy, think about giving out alternative treats like animal crackers, sugar free hot chocolate packets, cereal bars or granola bars. Plus, kids sometimes may choose cool toys like glow sticks, play-doh, or even stickers. Trick-or-Treat Exercise: Unfortunately, I’m seeing more parents driving their children around for trick-or-treat. Encourage walking from house to house. Not only is it great exercise, but it’s great socialization for the kids and for the neighborhood. Keep Your Favorite Sweets & Hide The Rest: Don’t keep all of the candy around. Keep only a few pieces around, and freeze the rest or hide the rest. Try to limit to 1-3 pieces of candy a day. Place with their school lunch or a piece of candy when they get home from school. Or, Give Away The Rest: When trick or treating is over, have the child make two piles: One pile of their favorite candy, and the other pile. Consider giving the other pile of candy to the local children’s hospital, to the food pantry, to the local nursing home, or anyone who you think you can give back to.